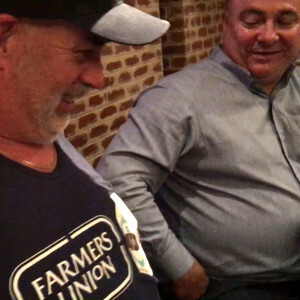 Former Farmers Union Iced Coffee marketing guru, Trevor Pomery, reveals his FUIC singlet during the recording of Adelaide Show 133, to the astonishment of Patrick Baker, former DV marketing guru. Is it an iced coffee or it’s nothing? And must that be a Farmers Union or can it be a Nippys or some other brand? In one of the markets that surprised the world and had a flavoured milk outselling Cocal Cola, the tension and the struggles between the two products were epic. Tonight, former FUIC man, Trevor Pomery, and former DV man, Patrick Baker, takes us behind the scenes of the great, South Australian Iced Coffee Showdown. For the Made To Move Minute, Max Martin … reflects on our fixation with iced coffee. and asks, Is it okay for hard-working people to drink iced coffee but maybe not desk jockies? In IS IT NEWS, Nigel quizzes us on our knowledge of … milk. And Andy and Marta return with a new album and a new song called, I Sing, in the Musical Pilgrimage. 2015 Battle Of Bosworth Puritan Shiraz, McLaren Vale … Tasting notes. This week: Is iced coffee fine for workers who do hard, physical work and not so good for desk jockies? For many iced coffee drinkers in South Australia, their choice of brand is a tribal one. If you attack their brand, they’ll defend it, sometimes with threats of violence. 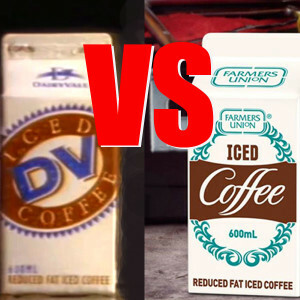 The frenzy of South Australia’s Iced Coffee Showdown reached fever pitch in the 1990s when DV poured money and strategic resources into the battle, even pulling in national celebrity, Rex Hunt, in a series of ads that really got tongues talking. But is all publicity, good publicty? Tonight we’ll find out with the man at the helm of Farmers Union marketing at the time, Trevor Pomery, and his opposite number from Dairy Vale, Patrick Baker. Due diligence: Trevor, is currently at Golden North, and Patrick runs Baker Marketing (where Steve works). And our song this week is I Sing by Andy and Marta, selected by our musical curator Adrian Miller, from Radio Adelaide’s Monday night program, Songcatcher. Come along to our final Adelaide Fringe live recording on Tuesday night, March 8, 2016, from 7-9pm at The Arkaba Hotel, for an intimate and fun evening of conversation with Adelaide ‘enemies’, Trevor Pomery and Patrick Baker, who were pitched either side of the South Australian Iced Coffee battles in the 1990s. Trevor Pomery has been the guiding hand behind the marketing of many household brands we are familiar with. Currently, he is currently the marketing and export manager for South Australian icon, Golden North but tonight we’ll be probing his past in the Iced Coffee game. Iced Coffee in the South Australian market is something of an international phenomenon on the worldwide marketing stage. According to sales figures from a 2014 report in The Australian, Iced Coffee sales in Australia were at $200 million compared to cola at $196 million. So Iced Coffee is big business and Trevor helped seal the deal for Farmers Union by championing the slogan, It’s A Farmers Union Iced Coffee Or It’s Nothing. Across town, Patrick Baker, who now runs Baker Marketing (where our Steve Davis works) was a sworn enemy of the Farmers Union folk. As part of the Dairy Vale marketing team, Patrick oversaw countless blind taste tests among blue collar, Farmers Union die hards, and saw for himself how the Dairy Vale blend would win hands down. However, the battle of the minds was a hard one and he has some ripping yarns to tell about how iced coffee drinkers reacted when faced with the conflict between their hearts and their tastebuds. When you click through to buy tickets from the Adelaide Fringe website, make sure you choose Tuesday, March 8. There are only 25 in total.